On December 27, 2015 February 16, 2018 By felicitousfelixIn Are There Lesbians? An browser-based choose-your-own-adventure game (thanks wikipedia! 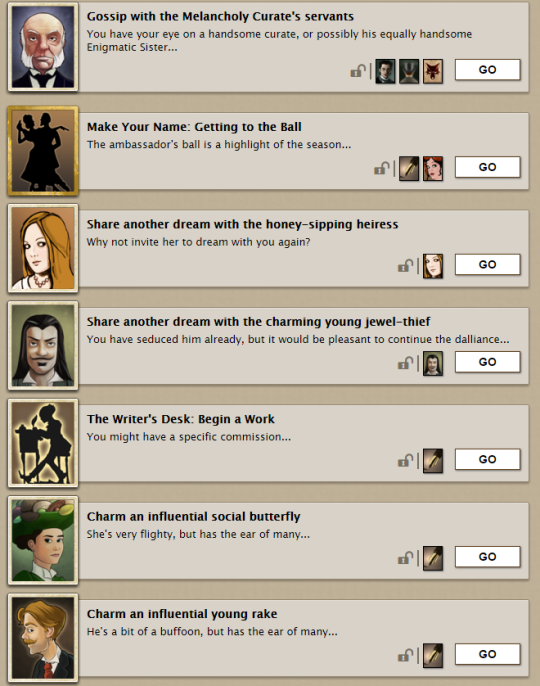 ), your main goal is to negotiate the society of Fallen London. Beyond that your quest is your own. You build up four traits – Watchful, Shadowy, Dangerous, Persuasive – by completing certain tasks and in doing so create your own story. 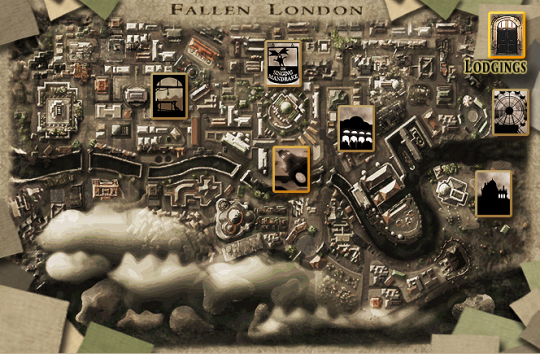 Fallen London is weird in the vein of Lovecraft or Welcome to Nightvale. It is fun and strange and terribly, terribly addictive. You are given 10 actions per hour (or 1 every 10 minutes) which is a hood thing because I would never get anything done otherwise – as is I probably spend too long watching the timer tick down! You can pay for more actions of course – a $7 subscription earns you Exceptional Friend status thus gaining you an extra candle, extra stories and access to The House of Chimes (I am sorely tempted but The GF is my grounding force in this matter). The game is thrilling and interesting enough not to need the extra story lines so it is entirely up to personal preference whether you spend money on the site or not. 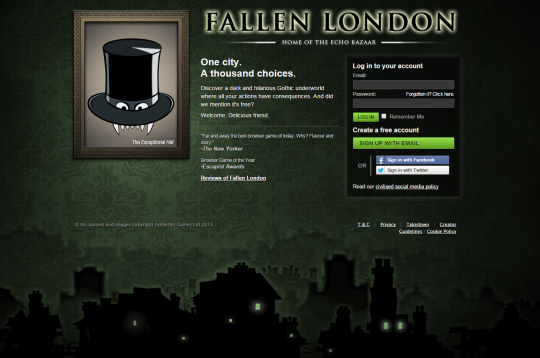 As for lgbtqa+ inclusively, Fallen London doesn’t seem to care too much for your gender. At the very beginning you may choose from a variety of portraits encompassing male, female and tentacled horror. While The GF tells me that your gender does help determine a few choices, it doesn’t affect much of the gameplay however I haven’t had too much course to test this so I can’t say for sure. For example my (swanky pirate) female character is currently in the act of seducing a honey-sipping heiress, a charming young jewel-thief, the melancholy curate or perhaps his equally handsome enigmatic sister, as well as charming an influential social butterfly. Fallen London managed to capture my interest perfectly and it’s safe to say that I have fallen head-over-heels for this little game. I can only hope that you will join me in the Neath delicious friend.